Habit at Enchanting Floral Gardens of Kula, Maui, Hawaii (USA). October 24, 2007. Origin and Habitat: Argentina, Brazil and Uruguay. Habitat: Grasslands, dry woodlands and savannah on warm winter climates that are subject to occasional frosts. 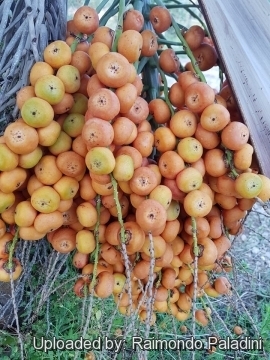 Description: Butia capitata is a medium sized, cold-hardy and single-trunked palm with long pinnate leaves that arch inwards towards a thick stout trunk and re-curve towards the ground. It grows only up to 6 m (exceptionally 8m) in a slow but steady manner. It is easily identifiable by its beautiful feathery fronds. Trunk: Stout, stocky, upright/erect 3,5-4,5 m tall, 30-50 cm in diameter. Usually, the old leaf stalks persist for years, but specimens with clean trunks are not uncommon. 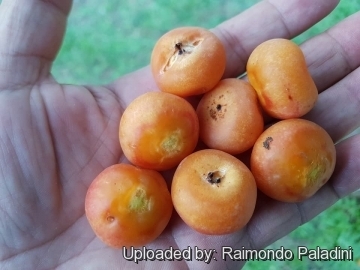 Fruits: Ripe fruit are about the size of a cherry and yellowish orange in size. 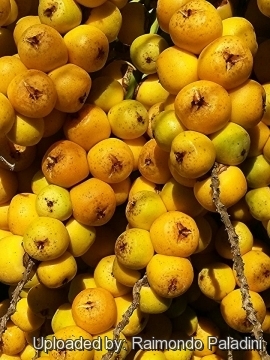 The fruit often called pindo dates are edible, rather tasty but extremely tart and sweet, with a flesh kind of like a hard pineapple. Fruits attract squirrels. 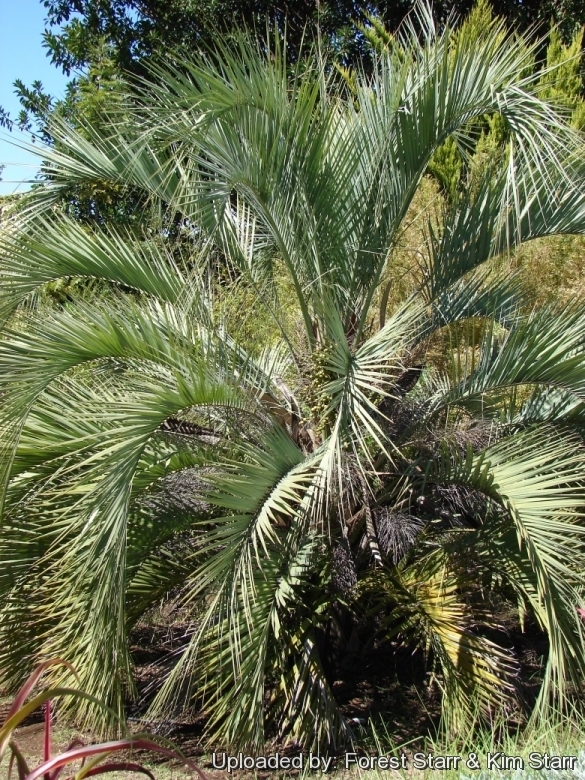 Remarks: There are several other species in this genus that are very similar in appearance, among them: Butia yatay, Butia eriospatha and Butia paraguayensis. All of these hybridize readily and many of the plants offered as Butia capitata may be hybrids. Butia can also be crossed with Syagrus romanzoffiana to produce the very handsome hybrid. 1) Forest & Kim Starr Butia capitata (pindo palm, jelly palm). Plants of Hawaii. <http://www.starrenvironmental.com>. Downloaded on 21 August 2014. 8) Beccari, O. (1916). “Il genero Cocos Linn. e le palme affini. Agric.” Colon 10: 489–524. 9) Glassman, S. F. (1979). “Re-evaluation of the genus Butia with a description of a new species.” Principes 23: 65–79. 10) Henderson, A., G. Galeano and R. Bernal (1995). “Palms of the Americas.” Princeton University Press. 11) Lorenzi, H.; L.R. Noblick, F. Kahn and E. Ferreira (2010). 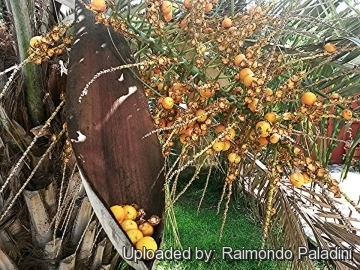 “Brazilian Flora Arecaceae (Palms).” Plantarum de Estudos da Flora Ltda. 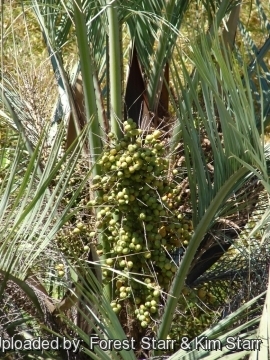 Cultivation and Propagation: It is an easy to grow palm that likes sandy soil, but is adaptable to clay and loam both slightly alkaline and acidic. Good drainage is also important. The root system of this species is very sensitive and good sized specimen is extremely difficult to successfully dig and transplant to another location. 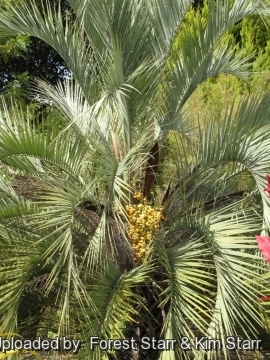 Butia capitata vary in shape. Specimens raised in dry and/or infertile soils tend to be smaller in stature with smaller leaves. Light also affects the plant's form while those grown in full sun are more compact. Fertilization: Need a perfect fertilizer diet including all micro nutrients and trace elements or slow release fertilizer. Micronutrient deficiencies are occasional problems. If it doesn't get enough Mn and Fe, the leaves take on a rather unhealthy yellow colour. Micronutrient deficiencies only show up on soil with a high pH. Watering: Drought tolerant, it thrives in fairly dry and hot climates, but enjoy also rainy climates and proved to tolerate a wide variety of conditions. In areas where summer rain is prevalent, it seems to put on rapid growth with this ample water, but it does not want to sit in continually wet, mucky soil. The roots and lower trunk can rot if soil is kept too moist. Hardiness: It is one of the hardiest feather palms, tolerating temperatures down to about -10 °C; it is widely cultivated in warm temperate regions (USDA hardiness zones: 8-11). 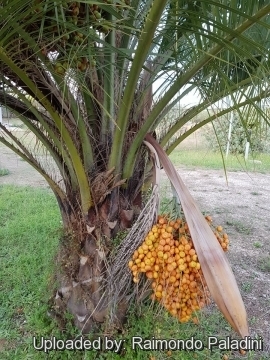 This palm is recommended for subtropical and tropical climates. Aerosol salt tolerance: No drought or salt tolerance. Gardening: Either as a single specimen or in groups, this is a strikingly beautiful species. Its very neat appearance and stature makes it perfect near highways and used to accent residential landscapes. Culture in containers is possible although growth rates are slower. A bright patio will provide an excellent environment for young specimens which can eventually be planted in a sunny location. It is urban tolerant. Plant 3-4 m apart as a street tree and they can be planted beneath power lines due to slow growth and small size. Food: The orange-yellow, juicy, edible fruit are often used to make jams or jellies. Remarks: The fruit, maturing in summer, can be messy on side-walks or patios, so you may want to plant 3 metres away from the walk or patio. Remove flower stalks to avoid messy cleanups. Propagation: Fresh seeds germinate quickly within a month of being planted and the seedlings are attractive. 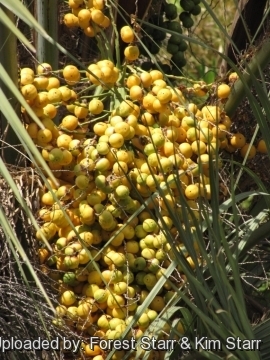 Young palms are often found under palms that have been allowed to produce fruit. It is not unusual to see offspring growing in the old leaf boots of a mature tree.